We (Vincent and Mei-Ching) planned to go to Vancouver in September for a family matter, and as a side-trip we decided to tack on a quick trip to the Canadian Rockies. We wound up joining a Mandarin-speaking tour to the Canadian Rockies. This particular tour started from Seattle, moved to Vancouver for 2 nights, then to Columbia Icefield and Banff National park; then returned to Seattle. 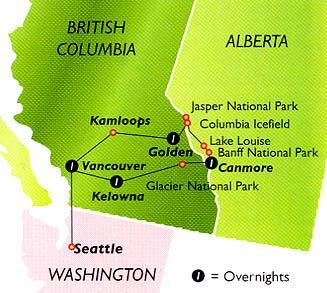 There were 41 participants on our Canadian Rockies tour. Some came from Japan, some from Taiwan, a few from China, and ten from Malaysia; the rest came from across USA. Our tour guide, Steven Doh, lives in Seattle with his family. He is originally from Taiwan, therefore he speaks Taiwanese, Mandarin, and English. Steven leads weekly Canadian Rockies tour for PCC company every year from May to mid September; quite a seasonal job indeed.